The newspaper of the American Medical Association announced its closure today after 55 years in print, in part because of the pharmaceutical industry. Today American Medical News, the newspaper of the American Medical Association, announced that its current edition is to be its last. It will not, as is the trend among dying papers, continue in a digital format. 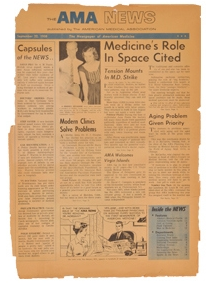 American Medical News has been in print since 1958, with a circulation of 215,000 — primarily family physicians who read it to remain abreast of new research, legislation, practice guidelines, and interesting cases. Pharmaceutical spending on all professional journal advertising fell by 31%, from $470 million in 2007 to $322 million in 2011, the most recent year of data made available by IMS Health, a market-analysis firm. Experts often have blamed the steep drops in ad spending on the number of top-selling drugs going off patent, without new blockbuster pharmaceuticals to replace them. Drugmakers typically devote most of their advertising to the first years after a new drug launch. American Medical News was how many primary-care doctors and academics kept up with the latest in the field. The paper's mission included "help[ing] doctors figure out the day-to-day problems that go with practicing medicine, bettering the health of the community, and the profession of medicine." That trade publications and medical journals suffer as a downstream effect of cheaper generic medications becoming available (which many physicians advocate, in the interest of making treatments more accessible to patients) further confuses the relationship between academia and industry.